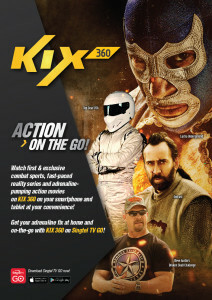 GrabHitch is partnering with the on-the-go action entertainment channel, KIX 360, on Singtel TV Go between 20th May to 10th June! 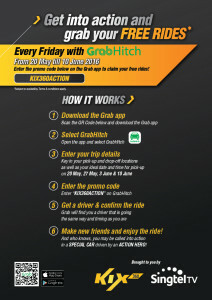 During this period, hitchers can grab a free ride every Friday with the promo code “KIX360ACTION”. You stand to win too! Complete 2 hitches as a driver on each Friday* and you could win a AMOY Hotel 2D1N weekend staycation package with Buffet Breakfast and complimentary set dinner at JIN Fine Dining. So get into action this month and meet new people, cover some costs and get rewarded for it! * There will be a total of 4 staycation packages, 1 for each Friday. * Prizes will only be tabulated at the end of the 4 week period. * A driver can only win 1 staycation package during this period.